Longtime residents of Pecos, Texas will associate the title of “Mr. Pecos Cantaloupe” with my maternal grandfather, M. L. Todd. A state historical marker at the West of the Pecos Museum recognizes him as the “father of the Pecos cantaloupe industry.” Granddad Madison died in 1967 at age 92, Grandmother Julia in 1969 at age 89. They are buried in the Evergreen cemetery west of Pecos. My parents, Neil and Zorene Thompson, were associated with the M.L. Todd&apos;s in the cantaloupe business beginning in 1938. My Sister Barbara and I grew up on our farm west of Pecos, and with the family cantaloupe business. We both graduated from Pecos High School and lived in Pecos until after college graduation. Mother and Dad lived on the farm until 1948, but finally moved into town. They stayed in the cantaloupe business until 1955, when they sold their interests to Marcus Dingler and Bob Dean. Daddy died in 1962. Mother remained active and interested in Pecos affairs, including the continued growth and change in the Pecos cantaloupe industry. She moved to Carlsbad, New Mexico in 1978, to be near Barbara and her family, Mr. and Mrs. John W. Coleman. Mother continued to lead an active life for a number of years, living in her own apartment. During this time she wrote a part of our family‘s history, which is now a treasured family keepsake. - -Mother died in 1994, at the age of 93. In 1987, the Pecos Chamber of Commerce sent Mother an invitation to attend the “Fourth-Annual Pecos Cantaloupe Festival” held each August. The invitation included a request for pictures of Grandmother and Granddad Todd, and information about the early days of the Pecos cantaloupe industry. Mother was very pleased at the special invitation, and Barbara and I and our families made plans to accompany her to the festival. Mother worked for many years to support and improve the Pecos Museum and to secure the state historical marker honoring her parents. At the time the marker was dedicated in 1970, our family presented the museum with photographs of Granddad and Grandmother Todd—“Madison and Julia” to their family and close friends. We made arrangements with the museum for these pictures to be used as part of the festival display at the Pecos Rodeo Grounds. 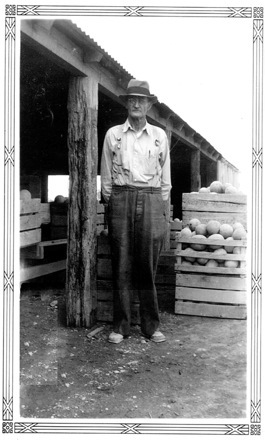 Many people have contributed to the growth and success of the Pecos cantaloupe industry...Granddad Todd himself lived to see many new players and radical changes in the business, and Mother and Dad many more. So, it was a great treat for our family to visit Pecos again in August of 1987, and to catch up on the changes in the people and processes in the industry. However, the following is about the beginnings of the industry, and about the part my family played in building it. I hoped it would be of interest to the festival, and to some of the younger generation in our own family. Grandad Todd circa 1938, at his original farm property and packing shed, across from the Evergreen Cemetary and extending to the Balmorhea highway. The farm home was adjacent to the present prison center. From one of Mother&apos;s few advertising ventures. This $10 ad ran in the August 1939 issue of Texas Hotel Review. Grandad had only one look for photographs... this was it! He is acknowledged as the father of the industry: “Mr. Pecos Cantaloupe,” M.L. Todd. His full name was Madison Lafayette Todd, but I never heard anyone address him on the street as anything other than “Mr. Todd.” Madison Todd was born in 1875 in Gladewater (Upshur County), Texas. He was married in 1899 to Julia Mackey in the small east Texas farming community of West Mountain, Texas, near where both their parents were born. They lived there until 1908, when they moved west to the New Mexico Territory. This move was dictated by the fact that, even as a young bridegroom, Madison had tuberculosis. His doctors thought he had only a short time to live, but that his life would be prolonged if he moved to a drier climate. Tuberculosis was such a pernicious disease in those days that Grandmother&apos;s father never expected to see his son-in-law alive again, and offered this somber admonition to his daughter as he kissed her goodbye: "Now Julia, when Madison dies, we want you to bring him back here for burial.” What a sad farewell... perhaps it made Grandmother determined to help him get well. And she did, working by his side in the fields, seeing that he got extra care and nourishment, and rest when possible. From the earliest days of their marriage until her death, Grandmother&apos;s life was centered around taking care of Madison and her children. The fact that Granddad lived to the age of 92 years can be attributed as much to Julia&apos;s prayers and care as to the doctors of the day and the hot climate of New Mexico. That is to say, there might not have been a “Mr. Pecos Cantaloupe” without Grandmother! New Mexico was still a territory in 1908, and Granddad Todd had filed on a 160-acre homestead near the small community of Ricardo, New Mexico (about 14 miles northwest of Ft. Sumner). Granddad moved himself and all of their household goods, provisions, and livestock in an “emigrant car” on the Texas & Pacific and Santa Fe Railroads. Granddad rode in one end of the car, in order to take care of his livestock quartered in the other end. Grandmother and the children followed by passenger car a few weeks later. For the first six months they lived in tents, while their four-room house was being built with the help of neighbors, because Granddad was so weakened by TB. Life on their homestead was hard, frustrating, and financially unprofitable for Madison and Julia. However, Mother recalls that these were busy and happy years for her and her brother, Judson. In the fall of 1916, Granddad Todd decided that he should move to where his children could get a better education. He told his children, “An education can never be taken from you, and that is what I want most to give you.” He traded his New Mexico homestead to a young man whose uncle was farming in Pecos, Texas. In the trade, Granddad received an undivided interest in a 160 acre farm located four and one-half miles northwest of Pecos. The farm was irrigated with water pumped from a deep well instead of the more common artesian water source. At Christmas time, the Todd family moved back to Texas. Patrons in the T&P Dining Cars were impressed with the look, texture, and taste of the breakfast cantaloupe they were served, and some asked where they were grown. The T&P graciously provided them with Granddad&apos;s address, and some began to send in orders. Granddad saw a new way to make his business grow: specializing in shipments of Pecos melons to individuals. Shipments were made directly to their homes by Railway Express. As these shipments continued through the twenties, the word about "Pecos Cantaloupes" began to spread and the small industry grew. More acres were planted, and other growers joined the business. Granddad Todd was very particular about shipping only the very best melons. The field melons were not only graded very closely for quality and appearance, but by ripeness. It is a tribute to the Railway Express service of days gone by that, by selecting melons with proper ripeness, it was possible to ship them in open slatted crates to any state in the US and have them arrive ready to eat. The tricky part was knowing what day to ship the melons, so that they didn&apos;t remain in the local Express Office over the weekend! Letters of appreciation and re-orders for the melons far outweighed complaints. Any complaints received were handled with a new prepaid shipment, no questions asked. From the early days of the T&P Dining Cars, some customers became special friends; many of them ordered year after year. She accepted and encouraged special orders such as this: “Please send a crate of Jumbo&apos;s to our home every week, hard ripe. For the last three weeks in August, please send this order to our summer home, Cherry House on the Hudson...etc.” Mother would type a personal letter of acknowledgement, wishing them, “a pleasant summer on the Hudson.” Some would order for their children, and then their children would order, and soon Mother knew the whole family! Incidentally, most of our orders came from out of town by mail, were paid for with personal checks, and very, very few bad checks were received. We had important commercial customers as well, who served our melons in famous and interesting eating places such as: The Fort Worth Club, the Dallas and Lakewood Country Clubs in Dallas, the Racquet Club in St. Louis, and The Colony and 21 Club in New York City. Dad had a wide-open field to modernize Granddad Todd&apos;s farming operations. (I remember when we retired Granddad&apos;s two draft horses, Dogie and Blue...) Neil was already a good all-round mechanic, but now taught himself to weld and to run contour lines for better irrigation. Dad designed several special tractor tools for cultivating cotton and melons, adapting them for hydraulic pickup years before they were available from the implement dealers. I believe we installed the first farm butane tank in Reeves County (with a gas Servel refrigerator that everyone came to see! ), and bought and used the first pick-up hay bailer in the county. Many of our customers and their friends that we shipped to were influential leaders in business and government, and Mother took great pride and interest in corresponding with some of the “rich and famous.” Some of our more famous individual customers included: President Lyndon B. Johnson (a regular customer before and after he was President), Miss Helen Keller, Mr. Sid Richardson, Coach Hayden Frye, Dr. G. V. Bridley at Scott and White Hospital, the Honorable James A. Noe - Governor of Louisiana, and many other business executives and political figures. In the early 40’s, Granddad Todd sold his remaining interest in the cantaloupe business to Mother and Dad, but he didn&apos;t retire... He continued to check the seeds, check the crop, and check the weather! He wanted to see that only the best melons were packed and shipped; however, he would always be satisfied with a few of the “culls” to “take home to Julia.” He was proud of the Pecos melon industry, but always minimized his contribution. Granddad had a rather stern countenance and was not very much of a conversationalist (Grandmother took care of that end of their marriage!). However, he had a dry sense of humor and often surprised you with his wit when pressed for a response. Once, when asked for his opinion about whether or not Pecos cantaloupes were really any better than those grown elsewhere, with a twinkle in his eye Granddad&apos;s reply was, “Well, if they are not, I&apos;ve got enough people fooled into thinking they are that I can sell all that I grow!” Let&apos;s hope that it will ever be so for the Pecos cantaloupe industry! -“Our Little House on the Prairie”, by Zorene (Todd) Thompson – published by Ray and Barbara Thompson, recounting life on a homestead in New Mexico Territory, 1908-1916. - In 1990, I received a request for background information on the Pecos cantaloupe industry from a writer for “Texas Highways Magazine.” The above story was used as source material for an excellent piece, published in the July 1991 issue of Texas Highways.